Dubai is the global operations and maintenance center of A380. Being the biggest world operator of A380 airplanes, engineering division of Emirates in Dubai became global leader in A380 maintenance. Airline Company maintains modern objects among which are 7 parking shelters for O/H and 4 shelters for A380 light maintenance works. Emirates Engineering has experience, skills and infrastructure for providing exhaustive maintenance and repair services of A380. For present moment 170 maintenance services have been made after the form C-check. 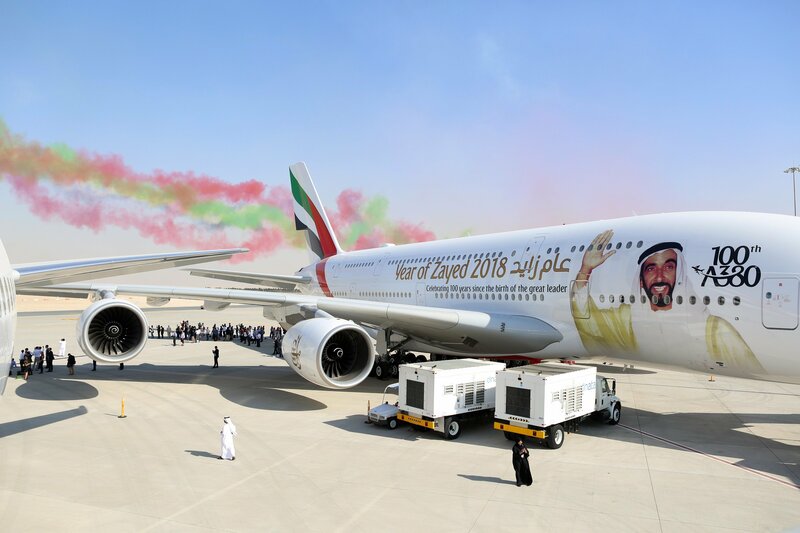 Among other things, more than 25 airplanes A380 were colored but on the body of 16 A380 were applied special decals besides EXPO 2020 on the A380 nose section. Coloring and decals’ application take place in Aircraft Appearance Centre in Dubai. In 2013 in the biggest A380 hub was opened gallery Councourse A built especially for receiving and maintaining A380. Object construction of which cost 3.3 billions USD provides travelers with incomparable comfort and possibility of direct boarding on A380 from waiting rooms of the first and business class and also other comforts of the world level.